The weather is warmer and dryer—an open winter is how the winter of 1991–92 is being described, though there is still most of January and all of February and March before this winter can accurately be described as open. Most of the moisture, to date, has come as rain and welcomed. The big snows came the last of October and first of November. The Polkites figured on a closed winter. Predicting is a chancy occupation when it comes to weather and length of life. Predicting is a mental exercise to forego surprises. The only surprise from this mental exercise is the occasional accuracy of the prediction. In 1862, with the origination of the Homestead Act, who could have imagined the changes—biologically, agriculturally, developmentally, the importance to the economy and/or the social-cultural evolution—that land uses and land ownership would mean to the Nebraska landscape? Nebraskans face a difficult decision. New EPA regulations could require the Nebraska Public Power District to invest more than $1 billion in order to bring old, dirty, coal-fired power plants into compliance. Let’s take a look at what this decision means for rural development throughout our state and the potential for a state-based new energy economy. We’ll then consider the impacts of coal and the role this resource will play moving forward. Do we invest more and more into an outdated energy future or are we ready to move beyond coal? Have you ever been sitting in the audience of a play or film and wondered about how the actors can get kicked, take punches, swordfight and fall down stairs without getting injured? The answer to that is one word: training! "Keynes Hayek: The Clash that Defined Modern Economics"
"Grand Pursuit: The Story of Economic Genius"
If plants had religion, oaks would be shamans. Human history is thickly forested with sacred trees, and no other native Great Plains presence symbolizes the aspiration to traverse the realms of heaven, earth and underworld. In this, bur oaks have no equal, being unmatched in longevity and reach. And they have another eco-mystical ability. They can enter and occupy a wide range of distant and forbidding habitats. Unlike other oaks, bur oaks are unperturbed by prairie fire, alkaline soils, drought, big bovines and competition by deep-rooted grasses. Following the publication of Aldo Leopold’s “A Sand County Almanac” in 1949, Rachel Carson’s “Silent Spring” in 1962 and Paul and Anne Ehrlich’s “The Population Bomb” in 1968, the early 1970s were a time of rapidly expanding consciousness of issues associated with environmental degradation and human responsibility for those impacts on the environment. In 1969 the Cuyahoga River in Cleveland, Ohio, actually caught on fire, and there was a significant oil spill in the Santa Barbara channel. These events likely contributed to precipitating the first Earth Day celebration in 1970. Approximately one year after the first Earth Day celebration, Paul Ehrlich and John Holdren published an important conceptual paper titled “Impact of Population Growth.” This paper postulated an oft-cited equation: I = P × A × T (where “I” is Impact, “P” is Population, “A” is Affluence and “T” is Technology). An essay written during the Prairie Writers Workshop, May 2010, at the Willa Cather Memorial Prairie near Red Cloud, Neb. Where are the hard edges when we consider this prairie before us? Perhaps a photograph would create the illusion of them: freezing a crystalline moment. But in motion, in real time, there are no real edges. Like Heisenberg’s particles—position and place and motion are not a unity. The edges of the prairie itself as a named formation are vague too. Its very name denoting “a little meadow” shows the lack of a suitable term. Those French trappers had known no such place to relate it to. Prairie is to place as impressionism is to art: it’s a genre of place. Click here for all the information you need for birding this year. 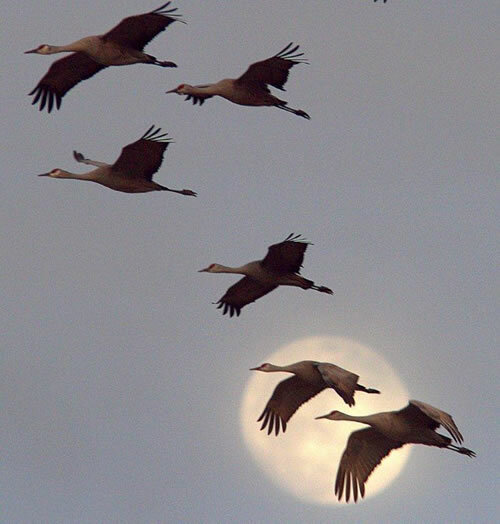 So you’ve always wanted to see the great sandhill crane migration but have never taken the time to get in the car and make the short trip to the central Platte valley? You get yet another opportunity. As they’ve done for millenia, the sandhills will arrive in early spring by the hundreds of thousands—one of the greatest migration spectacles on the planet. Little wonder that many people travel hundreds, even thousands of miles to witness it. If you’re a Nebraskan, the show literally comes to you. OK, you’ve decided to see for yourself what the hoopla is all about. How should you prepare for your initial crane-viewing venture? Few people are entirely neutral as to their attitudes about owls. As mysterious nocturnal visitors, their voices send fear into the hearts many but offer a haunting and relaxing mantra to others. Probably many people spend their entire lives without ever seeing a wild owl, their camouflage-like plumages blend into their background so well that a family of owls can exist in a hollow tree of one’s backyard without even being noticed. The Nebraska Unicameral has started its new session this January, and there are serious concerns about the potential passage of Legislative Bill (LB) 239. The bill calls for the voter to produce specific identification; if the voter is unable to provide that identification, he or she is not allowed to vote. 1st- What are annual funding needs for water development in Nebraska? 2nd- What qualifies as water development? 3rd- Who should decide how funds for water development are spent? 4th- What are possible funding sources?